Nancy Furstinger has a new book, UNSTOPPABLE: True Stories of Amazing Bionic Animals. She has agreed to give away a copy to one lucky winner. All you have to do to get in the running is to leave a comment. Reblog, tweet, or talk about it on Facebook with a link and you will get additional chances to win. Just let me know the other things you did to share the good news, so I can put in the right amount of tickets in my basket for you. Check back to discover the winner. Chris P. Bacon was born with malformed legs, but with the help of a wheelchair made of construction toys, he’s become a hero to people with similar challenges. 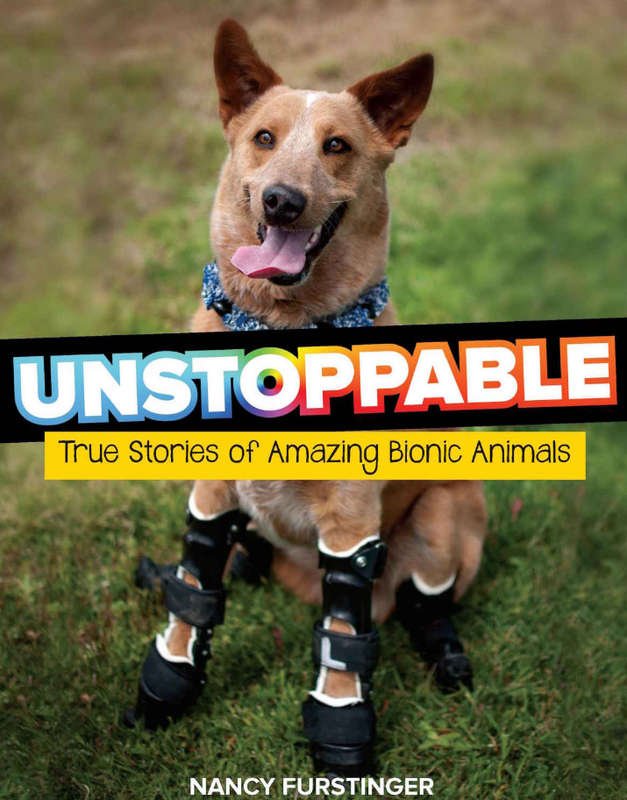 Nancy Furstinger profiles Chris P. Bacon and many other animals in Unstoppable—all of whom are making their way around with the help of prosthetics, braces, orthotics and wheelchairs! While reading these stories of perseverance and hope, readers will meet the caretakers, prosthetists, vets, and loving families that help to make recovery possible. Furstinger offers a glimpse into the cutting-edge technologies, such as 3D printing and brain-controlled prosthetics, that are helping to improve the lives of animals and humans alike. Chris P. Bacon was born with malformed legs, but with the help of a wheelchair made from construction toys, this pig has become an Internet sensation and a hero to people coping with similar challenges. Found crammed in a truck with thirty other potential pet alligators, Mr. Stubbs lost a tail to a fellow hungry gator. With a combination of movie magic and cutting edge science, Mr. Stubbs now has the world’s first prosthetic alligator tail – and a new chance at life. A quadruple-amputee Rottweiler named Brutus was the victim of neglect and, as a result, horrible frostbite. Now, he’s winning awards—and hearts—for the inspiration and excitement he inspires by living with four prosthetics. The idea for UNSTOPPABLE percolated in my brain for many years. I had adopted two Flemish giant rabbits, each missing an opposite back leg; I noticed how LuLu Belle and Woody persisted despite challenges. Suddenly I was encountering other unstoppable animals, including a paralyzed rabbit in a homemade wheel cart who I profiled in ASPCA KIDS: KIDS MAKING A DIFFERENCE FOR ANIMALS and two military working dogs, each of whom lost a front leg, whose stories I featured in PAWS OF COURAGE: TRUE TALES OF HEROIC DOGS THAT PROTECT AND SERVE. But it wasn’t until I visited Woodstock Farm Sanctuary and saw a goat in a wheel cart, a calf with leg braces, and a sheep with a prosthetic leg (along with the founder who proudly wore her steampunk prosthetic leg and was tailed by her tripod dog) that I started visualizing this book. I was amazed at the variety of unstoppable animals from around the world (everything from a guinea pig up to an elephant) that I discovered. I also profiled three animal prosthetic creators and their amazing careers, which suddenly emphasized STEM connections. I knew I needed an animal-friendly publisher and so requested that my agent submit it to Houghton Mifflin Harcourt, which had just published my bio: MERCY: THE INCREDIBLE STORY OF HENRY BERGH, FOUNDER OF THE ASPCA AND FRIEND TO ANIMALS. And I was thrilled that my editor there acquired this book and came up with the great idea to wrap the story of the Woodstock Farm Sanctuary animals around the other featured animals. But my book’s journey to publication did hit bumps: I had to learn the math behind digital images to make certain that they had a high enough resolution for publication. (Non- fiction authors are expected to supply high-res photos along with the manuscript. I begged and borrowed, paid for several, and shot some myself, even getting gored by an angry cow in the process!) From concept to publication (October 10, 2017) took years, during which I kept checking to see if anyone else had come up with this terrific topic (I already knew that there were 2 picture books focusing on 2 of the animals I profiled). Along the way the title was changed (it was originally INSPIRING) and so was the cover design. The book was honored as a Junior Library Guild selection and has received positive reviews. And now comes the fun part: sharing my book with young readers—I created my first PowerPoint presentation to introduce them to the animals and even bring along actual prosthetic legs used by dogs and sheep! Maybe some kids in the audiences will be inspired to adopt physically challenged animals, or to consider a career as a veterinarian or prosthetic maker. Thank you, Nancy for sharing your book and journey with us. It looks like an very interesting book. I am sure the winner will think so, too. This story sounds amazing! I wish it had been out when I was working with kids in SpEd. I am eager to read this myself, and sure it is going to find a large audience in schools! Thanks, perhaps you can do a volunteer reading with a SpEd class?! Looks like a great book. That’s one BIG bunny Nancy’s hugging! 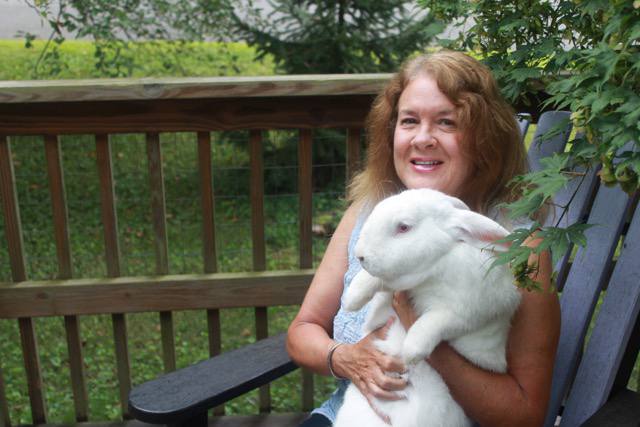 Thanks, Marcia, that’s Marshmallow, who inspired one of my picture books (The Forgotten Rabbit)! This would be an awesome book for my first grade grandson. Just shared on FB and Twitter. Thanks! Thanks, Carol, I’m sure your grandson will love learning about these Unstoppable animals! What a stellar topic! Congratulations! Thanks a bunch, Carrie–I adore animals so it was a natural fit! What a terrific book! It’s hard to imagine anyone of any age who wouldn’t admire these beautiful, courageous animals. Thanks for the chance to win a copy. I’ve tweeted a link:https://twitter.com/carlrscott/status/946440353258672128 and pinned an image on Pinterest with a link as well: https://www.pinterest.com.mx/pin/336573772144133275/. Thanks again #HNY2018! Fantastic, I appreciate your sharing the chance to win–best of luck! My daughter and I both love Nancy’s book ‘The Forgotten Rabbit’, so being adopters of special needs animals I am confident that we’ll just as thoroughly enjoy this book too. Sharing on my facebook page. Thanks so much, Janet, and I’m certain Emily will enjoy this book, too…it features a rabbit in a wheelcart @ a children’s hospital in Israel! Kids of all ages are certainly intrigued by the variety of animals I’ve featured: from a guinea pig to an elephant! Fascinating topic that’s sure to inspire others. Much appreciated, Marilyn! I feature 3 people who design prosthetics for animals in the book (2 of them also wear a prosthetic leg). This would be a rewarding career for kids to consider; also they might be open to adopting a physically challenged animal. Oh, my goodness!!! So much LOVE from/for this post! This book looks amazing for me, my family and animal lovers of all ages! Thanks for all your research and perseverence. I’ll post to my FB and Twitter accounts too! Hoping all you animal lovers enjoy reading about the Unstoppable animals…and humans too! Interesting story behind the story, Nancy! Thanks, Barb, this is the third book idea spurred by my rescued animals! As an animal lover, I’m sure you’ll find the stories uplifting, Eletha! And the winner was: Janet Cruickshank! She is busy reading Unstoppable with her daughter and will pass it on to another family.